I am going to start with perhaps the least known but most visible of local architects, Charles Quincy Clapp. Born May 26, 1799, Charles Quincy Clapp, CQ for the sake of expediency, was the elder son of a prosperous Revolutionary War veteran and trader, Asa Clapp. 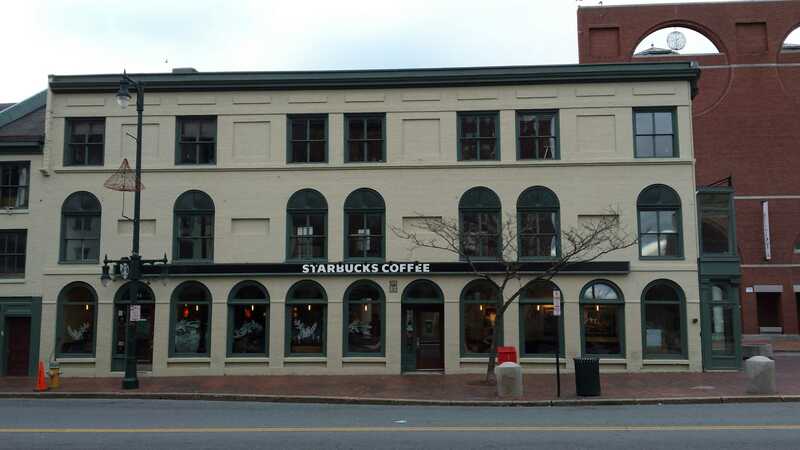 The Clapps, Asa senior and junior & CQ, were heavily involved in real estate in Portland for a period stretching from the late 18th, through the 19th, and into the early decades of the 20th centuries. There isn’t much history regarding CQ’s education. Newspapers at the time of his death used the term ‘liberal’. That of course had a very different, if undefined, meaning then. He graduated from Bowdoin College in 1817. As the first college program for architecture in the US was started in 1865, we can be sure he did not have any formal architectural schooling. I think it’s important to note that Charles Quincy did not call himself an architect. He was a merchant and property owner/developer who did his own design work. This can be seen in the excerpts of the 1823 & 1850 Portland Directories seen below. 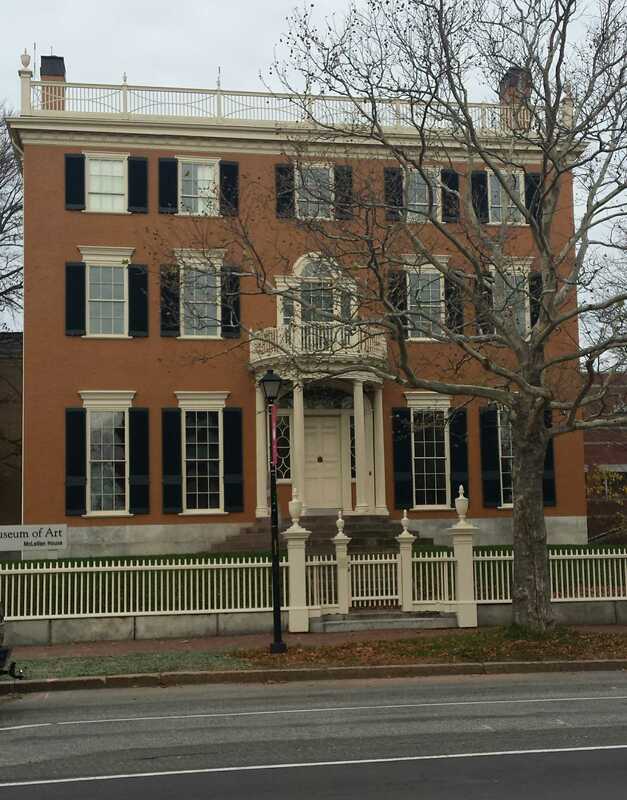 In 1804, Asa senior remodeled his home on Congress St, long since demolished, and may have hired the up and coming housewright/architect, Alexander Parris, to design the changes. Perhaps a very young Charles spent some time with Parris prior to his moving to Boston in 1809. When, due to the effects of the Jeffersonian Embargoes and the War of 1812, Hugh and Stephen McLellan were forced to sell their grand homes on High Street, the elder Asa Clapp was there to purchase them. Stephen’s home, now the Cumberland Club, would be given in time to Asa the younger whilst Hugh’s, now a part of the Portland Museum of Art, would go to Charles on his marriage to Julia Wingate. But for a brief period when they lived next door in a house of his design, they would live in the home until they died. Charles Quincy seems to have had little interest in politics at any level. He was an aide to the governor and a state representative in 1832-33. Other than that, he seems to have kept to business and was a consistent booster of his native city. Some time around 1823, CQ planned and executed renovations to both his and Asa’s homes The most visible of these alterations being extension of the first floor windows to their current heights. In 1832 Charles was either hired or convinced the city ‘fathers’ to hire himself, history is a bit hazy here, to redesign the facade of the ‘Town House’ or city hall. The building was only 7 years old at the time. There is a tendency to wonder why major changes might be needed so soon. 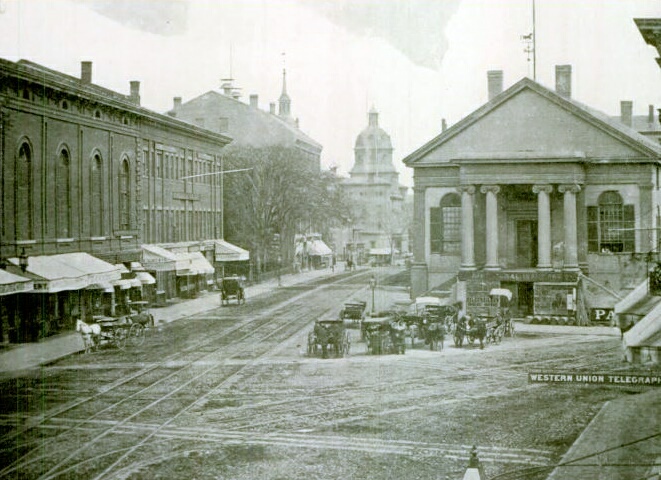 Portland was in a growth spurt that would see its population jump from 8,581 in 1820 when Maine attained statehood to 15,218 in 1840. It could be the popular style of architecture was moving to the Greek Revival and away from Federal. The building was a fairly severe Federal plan. CQ did seem to display a dislike of the more restrained expressions of the style. His alterations to Asa’s and his homes endeavored to make them more ‘modern’ for the times. It would seem the goal was the same with the town house. Clapp’s alterations involved covering the second floor windows on the Market Square facade. He then added a Greek entablature held up by some rather chubby Ionic columns. This was attached to the wall and included pilasters and a fully articulated frieze. All working to close the pediment and frame the entrance. The Ionic order and full entablature would be a portent of things to come. But Charles Quincy Clapp was not done. He also added a pair of arcing stairways to reach the second floor. Finally he removed the cupola so prominently shown in the drawing of the original building. The cupola would end up on one of the original buildings of Westbrook Seminary now the University of New England. It is still there to this day. The earliest known complete design of CQ’s was the Clapp, now Hay, block at the corner of Congress & Free Sts. It was constructed in 1826. 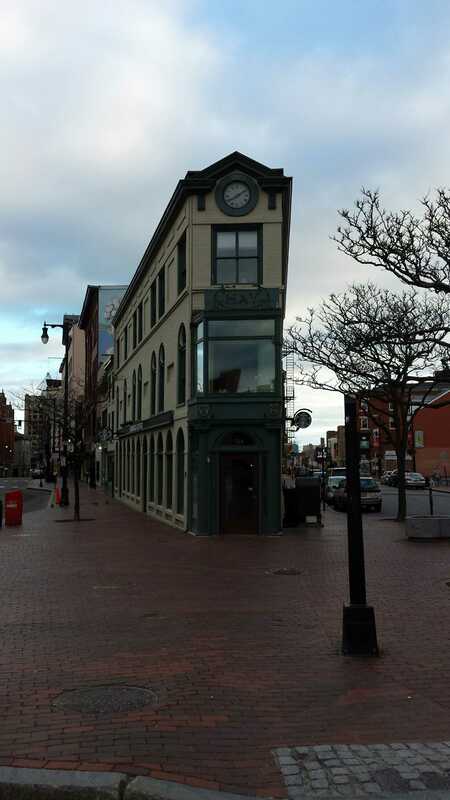 Originally 2 stories, this group of 3 conjoined buildings is well known in the city. The Free Street facades are simple with little decoration and clean cut window and doors. The Congress Street facades are more lively with varied arrangements of windows and doors on each building. Most prominent of these is probably the ‘flat iron’ at the head of the group. Here we are presented on the first floor with a series of round topped windows and doors that are quite wide. When seen as a whole, the eleven openings seem to blow the entire wall surface open. There is practically no wall left. The second story shows seven windows of the same size as the first floor laid out in a more functional manner. The wall spaces between the groupings are relieved with rectangular niches. The other two buildings in the group are more subdued. 588 Congress is a narrow 2 bay, 3 story building. It has a fairly typical first floor with a large display window with an entry to its right. Above are 4 large windows equally spaced over the 2 upper floors. 586 Congress has a curved display with 2 doorways to it’s right. Above is a handsome composition of 3 windows grouped in an opening. They are divided with panelled pilasters topped with ionic capitals. The window group is topped with a dentiled apron. The third story is a garret with 3 small square windows grouped tightly in the middle. Above this is a modilioned cornice with a flat balustrade with urns on the panelled posts. 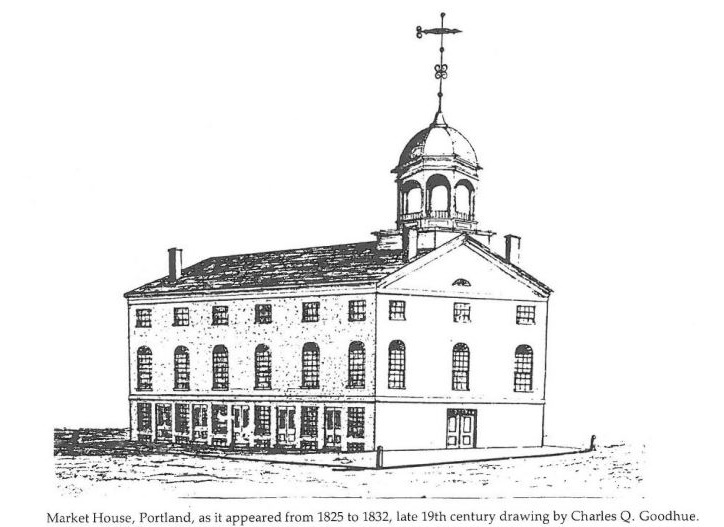 Clapp’s next effort was the Portland Exchange Coffee House of 1828-9. 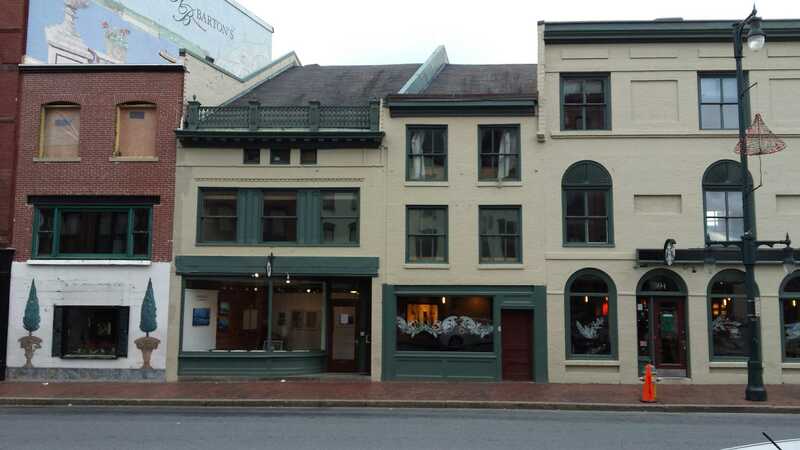 It was located in the corner of Fore and Market Streets. 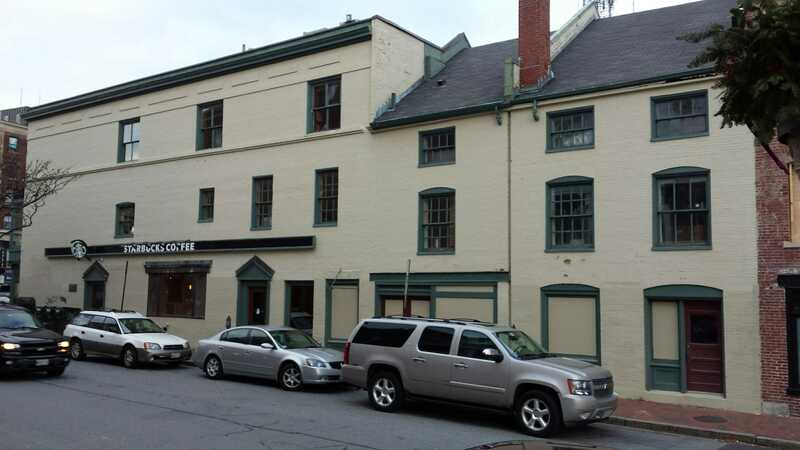 It had shops on the first floor, including bar on Market st, and a hotel in the upper floors. From descriptions it seems to have been a bit controversial in its design. It, along with several other buildings owned by the Clapp family, was lost in the fire of 1866. In 1836 CQ was involved in creating a hotel in Town House Square. This was originally created by merging a set of buildings on the lots across Federal Street from the town house into one structure. 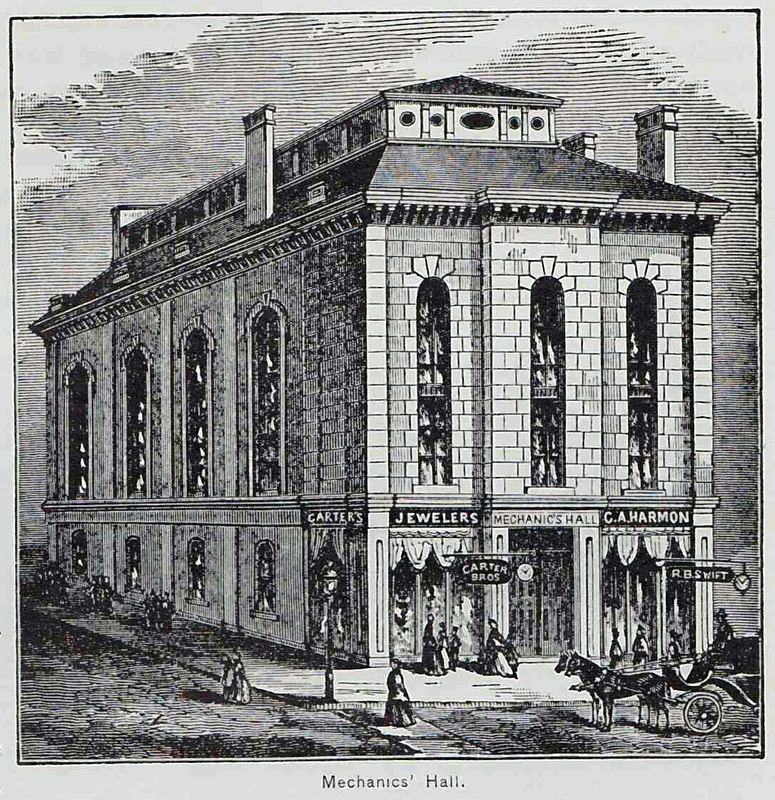 Over time, it would see many alterations before becoming the United States Hotel which stood in what is now Monument Square until the 1960’s. For this building and the Coffee House I can find no photographic representations. All information is based on period descriptions. Around the time the Clapps were completing the Coffee House, Charles and Julia started to plan a new home for themselves that would be built next to their current house. This building would cement CQ’s legacy in Portland down to this day. Please be sure to come back for part two of our look at Charles Quincy Clapp.